Now that the Supreme Court has upheld President Donald Trump's travel ban, the American Civil Liberties Union is looking at possible legal ways to keep fighting it and Muslim civil rights groups are condemning it. At the same time, Trump is calling the decision a "great victory" for American security and the American people. Nihad Awad, Chief Executive Officer and Founder of the Council on American-Islamic Relations, called the decision extremely disappointing and said it has "taken us back to the dark ages of our society." Sisters Michelle Edralin and Nicole Edralin, right, from Highland Park, console one another outside the U.S. Supreme Court as the court issued an immigration ruling June 26, 2018 in Washington, D.C., upholding President Trump's travel ban. 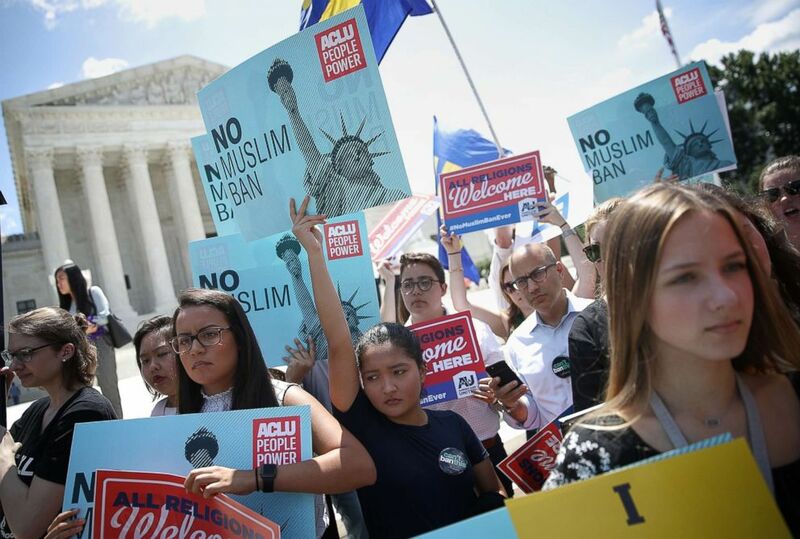 "The Supreme Court decision today has given the Trump administration a free hand to re-inject discrimination against a particular faith back into our immigration system, which was rejected more than 50 years ago," Awad said. "The Supreme Court's decision ignored the fact that this president and candidate has targeted a particular faith community which is Muslims here and abroad," he continued. Awad called the Trump administration a "white supremacist administration" that injects fear into "faith groups and people of color." CAIR attorney Gadeir Abbas said the decision will be remembered by the Muslim community similar to how the Japanese-American community views the court's Korematsu ruling or how the African-American community views the Dred Scott decision that slaves were not citizens. Caitlin Sanger, of Franklin Park, N.J., pauses to cry as she speaks to media outside the Supreme Court in Washington, D.C., June 26, 2018, as she speaks about her father being detained by ICE and protests immigrant families being split up. Chief Justice John Roberts wrote in Tuesday's decision that the reference to Korematsu in the case gave an opportunity to express what he said is obvious, that Korematsu was "gravely wrong" and has been "overruled in the court of history." 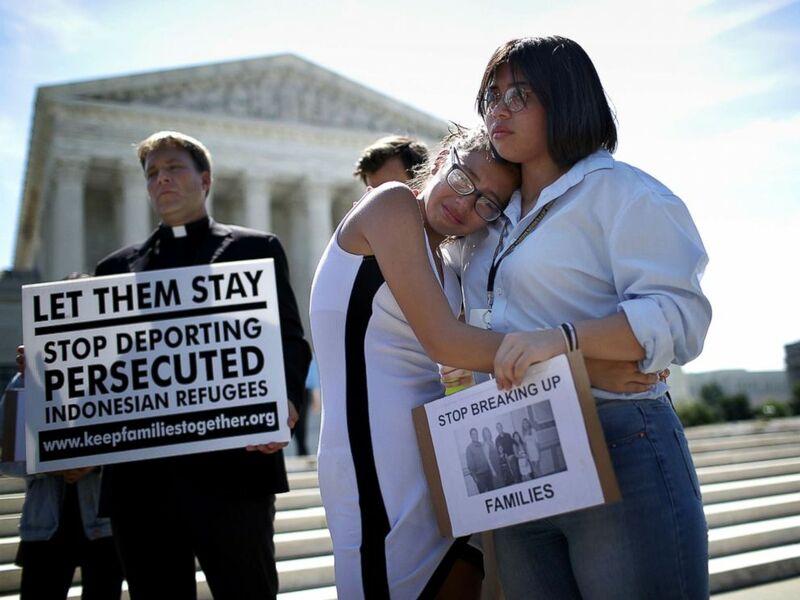 ACLU Immigrants' Rights Program Director Omar Jadwat said the decision is a "great failure" by the Supreme Court, but that it isn't a green light for the administration in other pending legal challenges to the administration's immigration policies, such as family separation or the Deferred Action against Childhood Arrivals program. 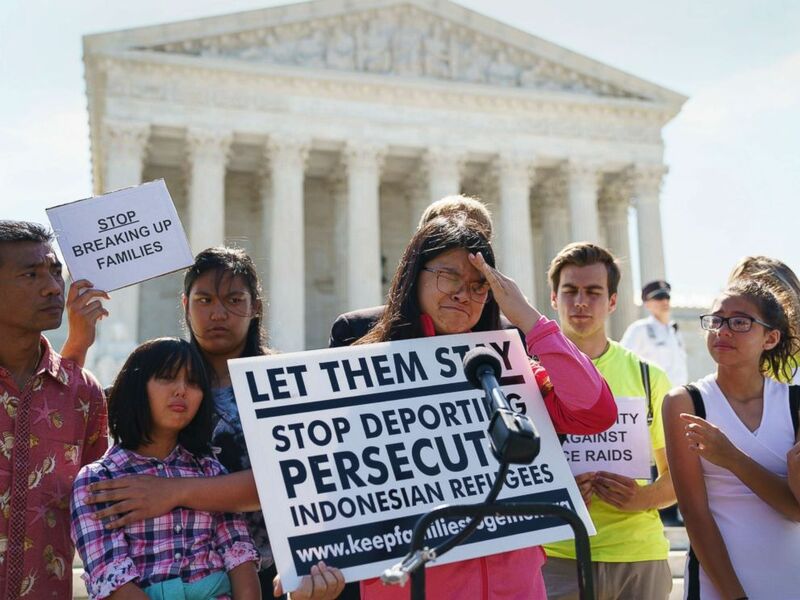 "Today's Supreme Court ruling repeats the mistakes of the Korematsu decision. It takes the government lawyers' flimsy national security excuse for the ban at face value, instead of taking seriously the president's own explanation for his actions," Jadwat said in a statement. "It is ultimately the people of this country who will determine its character and future. The court failed today, and so the public is needed more than ever." Protesters hold up signs that read 'No Muslim ban' against President Trump's travel ban outside the U.S. Supreme Court as the court issued an immigration ruling June 26, 2018 in Washington, D.C. But Trump applauded the ruling and said in a statement called it a "tremendous victory" for the American people. "In this era of worldwide terrorism and extremist movements bent on harming innocent civilians, we must properly vet those coming into our country. This ruling is also a moment of profound vindication following months of hysterical commentary from the media and Democratic politicians who refuse to do what it takes to secure our border and our country.," he said in a statement. "As long as I am President, I will defend the sovereignty, safety, and security of the American People, and fight for an immigration system that serves the national interests of the United States and its citizens. Our country will always be safe, secure, and protected on my watch." Attorney General Jeff Sessions also said the decision is a "great victory for the safety and security of all Americans" and called it "critical to ensuring the continued authority of President Trump – and all future presidents – to protect the American people," in a statement. "What is legal is not always just," he said in a statement. "A narrow ruling on whether or not the president is in possession of statutory authority to implement this policy avoids the basic question of whether or not it’s the right thing to do." What is legal is not always just. A narrow ruling on whether or not the president is in possession of statutory authority to implement this policy avoids the basic question of whether or not it’s the right thing to do. The ACLU and other activists quickly turned to upcoming elections to call for action. Former president of Planned Parenthood Cecile Richards spoke out about the travel ban decision as well as a separate decision regarding crisis pregnancy centers, saying "we've got to be ready for November." SCOTUS today: upholds the immoral Muslim ban and says it’s just fine for fake clinics paid for with tax $ to lie to women about their pregnancies and withhold medical information. We’ve got to be ready for November. Hawaii challenged the travel ban partly on the grounds that it hurt the state's university system by banning potential students from entering the country. The president of the Association of American Universities said the travel ban will have "deleterious effects" on higher education in the U.S. but that the association they will continue working with the federal government. "Our global leadership role would not be possible without the extraordinary flow of international talent, drawn here by academic opportunity and American values. It is critical to American economic competitiveness that the U.S. remain open to the world’s best students, scientists, and scholars," AAU President Mary Sue Coleman said in a statement. ABC News' Luke Barr and Samantha Reilly contributed to this report.